Last Saturday I gave you my tasting notes on a Bladnoch from the independent bottler SMWS (Scotch Malt Whisky Society). 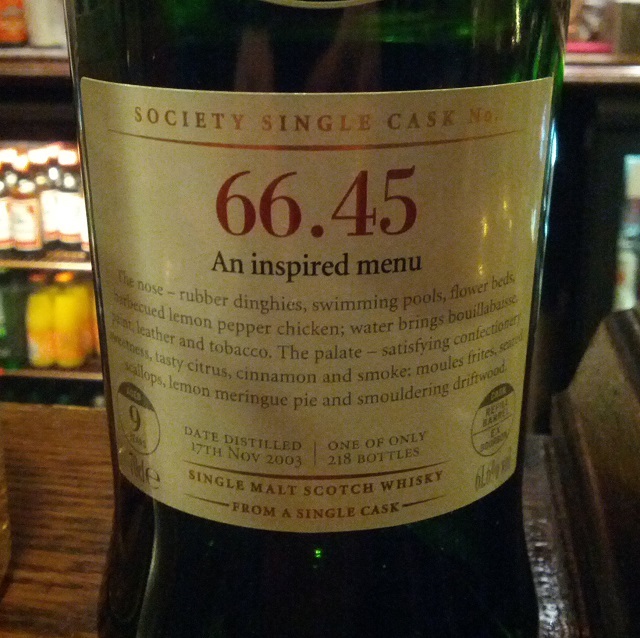 Still at The Bon Accord in Glasgow I got a chance to taste this lovely dram. Today the time has come for distillery 66; Ardmore. This is not a distillery that I have tasted a lot of whiskies from. How about you? The whisky was matured in refill barrel, distilled 17th November 2003, no bottling date. The outturn was 218 bottles. Nose (24/25): A rich an delicate smell of vanilla, licorice and strawberries. Some gentle smoke. And I could sense the smell of lemon, like the smell of a Lemon Sherbet (which of course I had to buy in Scotland). Taste (22/25): A rich taste. The smoke was more obvious here. Sweet licorice. Lemon Sherbet on the taste as well. Do you remember the candy licorice pipe? Well, this was the taste of it. Quite rough on the palate. Finish (21/25): The finish was quite peppery with a lot of licorice. It reminded me of the candy Nox (sweet licorice caramel). Some smoke hiding in the background with ashes. Balance (22/25): A pretty dry aftertaste, but still very tasty. Quite a lot of candy associations on this one!